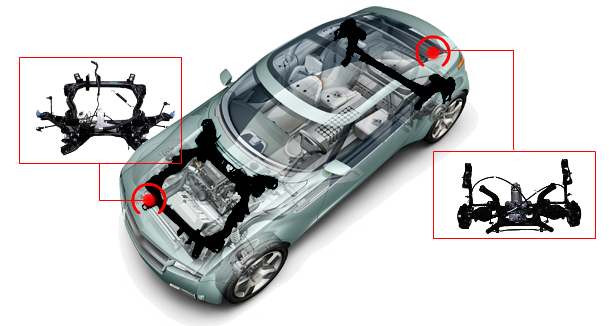 Chassis modules locate the front and rear suspension systems, steering system, rear axle and engine mounts. They are also key in achieving ride and handling performance goals, meeting alignment specifications, camber, caster, toe., and thrust angle. 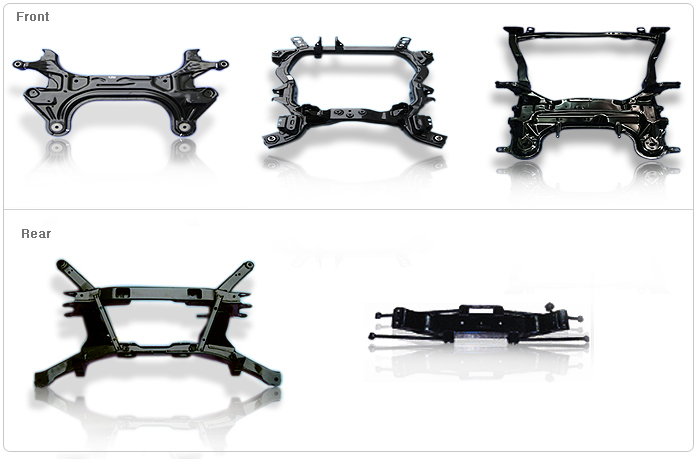 Austem currently supplies fully built up Chassis Modules and many of the major parts that go into these modules, such as cradles, control arms and links. A major part of Austem’s chassis business is underbody cross members and cradles. Cross members typically mount laterally across the vehicle, providing additional stiffness and rigidity to body structures. Cradles perform a similar function, but with more of a perimeter configuration bridging both cross-car and fore/aft structures. Both provide mounting attachment features for other vehicle components and systems, such as suspension, steering and engine mounts. The function of control arms is to guide the suspension, wheel and tire through its prescribed range of motion/geometry, attaching through the bushings and ball joints. Austem supplies both upper and lower (see below) control arms. The axle supports the mass of the vehicle, locating both the springs, and shock absorbers, basically connecting the wheels to the body structure. It is also a means of delivering both motive power and stopping power to the wheels via the wheel bearings and brakes. Axles are divided into two categories, drive axles that deliver driving force to the wheels, and dead axles that support the mass of the vehicle. Austem supplies twist beam / compound crank axles, which fall into the later category.